Disclosure: This post was sponsored by KORXX. All opinions are my own. We found a new favorite building toy for play, learning, and imagination, and are so excited to share it with you. If you haven't played with KORXX blocks before, you are in for a fine motor and visual motor integration treat. 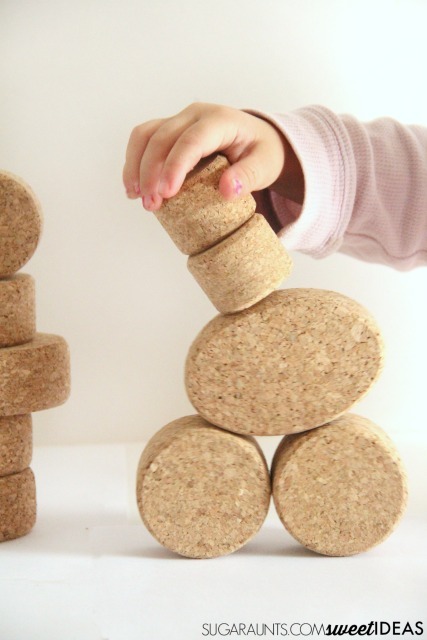 These cork building blocks are a natural and sustainable and a light material for little builders. We received a set of KORXX blocks to try and had a blast using them for a visual motor integration challenge. Using blocks to assess and build a child's visual motor integration skills are an easy way to challenge the skills needed for skills such as handwriting and letter formation and any task that requires the child to use the hands and eyes together in a coordinated and effective manner. 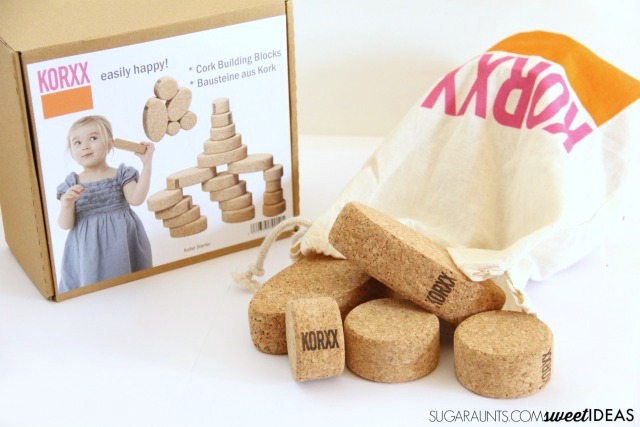 When we played with our KORXX blocks, we were excited to see how the blocks can easily be used to create three dimensional or two dimensional constructions. The therapist in me immediately noted the unique opportunity for addressing visual motor integration skills in this toy! Blocks are quite often used as a therapy tool to address and assess visual motor integration skills. The fact that blocks are a toy that is common in classrooms, playrooms, and therapy gyms makes using blocks for eye and hand skill needs easy and fun for kids. Visual motor integration skills are essential for any task that requires the hands to manipulate items based on what the eye perceives. In that manner, our eyes must perceive certain information and process it to allow our hands to work in an efficient manner to produce written work, catch a ball, manipulate clothing fasteners, or copy and draw shapes and pictures. Visual motor integration is an essential skill needed for forming and copying letters in handwriting. Skills that fall under visual perception are needed for visual motor integration. Skills such as form constancy, visual memory, visual discrimination, visual figure ground, visual closure, and visual sequential memory. Form Constancy allows us to recognize shapes or letters and numbers no matter what position they might be in. Blocks positioned on their side or in a different direction are still the same block. A large oval shaped KORXX block is still a large oval shaped block and can be recognized for use in copying block patterns. Visual Memory allows us to hold a memory in our mind of something we just saw. It also allows us to recall letter formation when writing. When we shift our vision to copy written work from the chalk board onto our paper, we are using visual memory to hold and then recreate that piece of information. KORXX blocks can be used to address this skill by creating a block form in the upright position and then constructing a two dimensional copy of that form with the same shape and sized blocks. Visual Discrimination allows us to discriminate between differences in parts of letters (for example, we are able to see the difference between an "R" and a "P"). 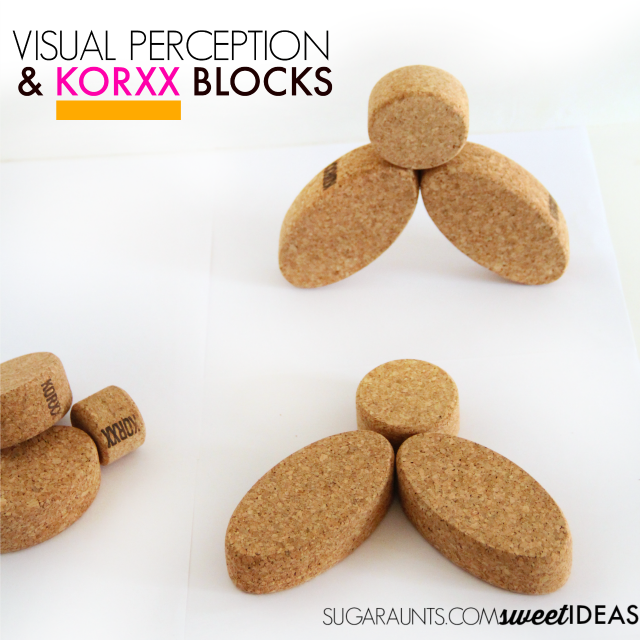 The different sizes in the KORXX block sets are perfect for this visual perception skill. Visual Figure Ground is a skill that allows us to locate and identify items when they are scattered among other items. Locating a single puzzle piece on a table of puzzle pieces is just on example of this skill. Use the KORXX blocks to locate needed pieces when they are scattered on the table. Visual Closure allows us to identify an object when we are able to see only a portion of it. Blocks that are stacked in a scatter on a table surface require visual closure for children to locate specific needed pieces. They can locate a small oval KORXX block when it is partially covered. Visual Sequential Memory allows us to create words or numbers in the correct sequence. When building and copying block forms, we need to start with the correct KORXX blocks in order to copy the form. So, using the parts of visual perception is a necessary part of copying letters and words in written work, math problems, and block forms in a play activity! 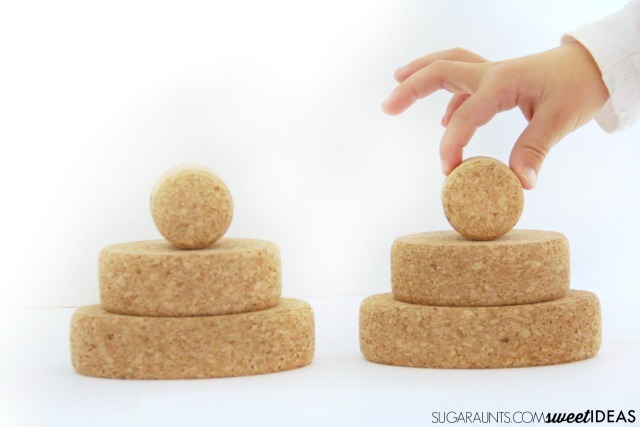 Related Read: Use blocks to address fine motor development. For our block play, we used our Kuller set KORXX block set to copy different forms. I created a few multi-dimension block forms to add a depth perception component. I set up blocks in front of my preschooler and asked her to copy the forms. By looking for the correct block on the table surface, she had to use all of the visual perception areas described above. This is such a great exercise for kids who are copying written work from an overhead position. In the classroom, kids might have to copy their homework from an overhead position. Between using the information they perceive in combination with their motor component of forming letters and manipulating the pencil, there are a lot of areas where illegibility can occur. Try using simpler block copying forms to address visual motor and visual perception needs can be done with forms placed flat on the table surface in a top-to-bottom orientation. Place the block form on the table and the child can construct their own form directly under the block form. Limit the number of KORXX blocks that are presented to the child. 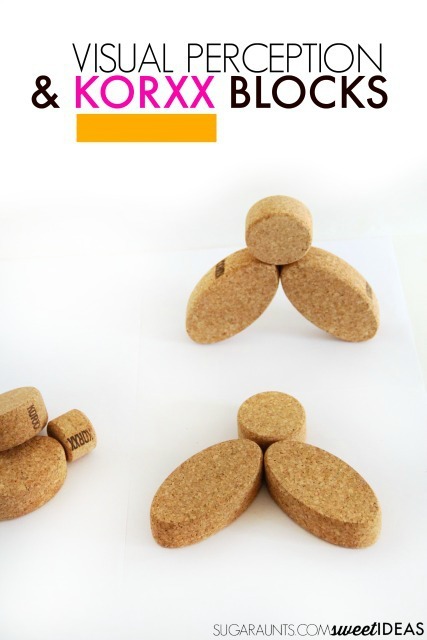 These eco-friendly blocks are all natural and made free of any harmful contaminants. There are no phthalates, dioxins, or other sensory emissions. The product adheres to the guidelines for children's toys (under 3 years) and the harmonized standard DIN EN 71. 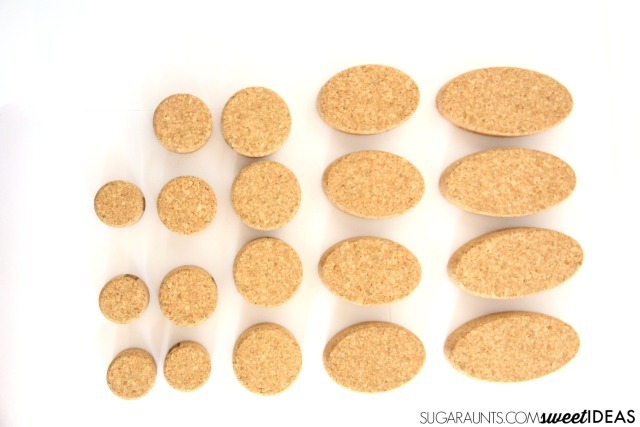 The soft and light cork blocks provide excellent stability without slippage. This makes them perfect for grasping by young children. 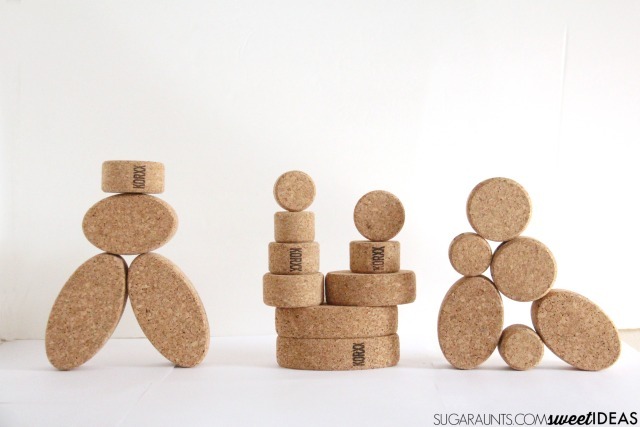 The KORXX bricks are made from natural cork harvested without harming the trees. 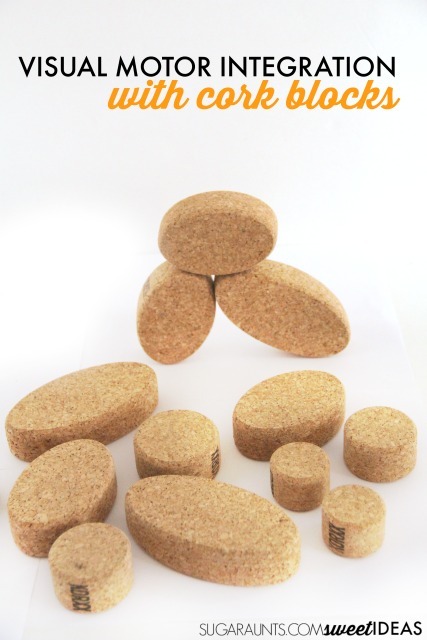 KORXX is an all natural and sustainable building block made from natural cork harvested without harming the trees. You can purchase any of the KORXX block sets here.